Full-moon names date to the Native Americans, living in eastern and northern North America. October’s full moon is known as the Hunter’s Moon. After the fields have been reaped, making fox and other animals easier to spot, hunters had an easier time of stalking their prey over the fields’ stubble. This year the Hunter’s Moon was accompanied by a total lunar eclipse. Some were calling it the Blood Moon. The scope of such is far beyond the simple appreciation of Mother Nature’s beauty that we wish to share with our guests. European settlers adopted the moon names used by the Native Americans; but most people today know only a few of these names. A full moon, if not obscured by clouds, would be helpful, for hunting. 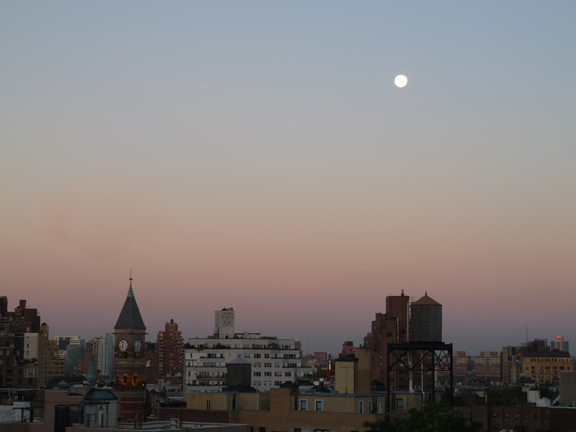 We have no need for this use of the full moon in 2014 New York City. Electric lights of every sort in the city dim the effects of nighttime celestial bodies, moon and stars. An early morning sighting was how we saw this year’s Hunter’s Moon. It was quite a good thing, an unexpected joy to behold, causing us to gasp aloud. October’s full moon is the first Full moon after the Harvest Moon. The sight of the moon fades as sunlight, the source of its “light,” grows stronger.